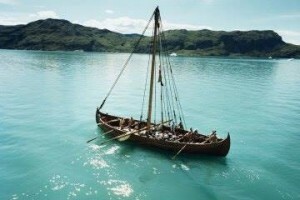 A shipwreck in the English Channel may have yielded quite a treasure: Scientists think they’ve found a Viking sunstone, the mythical navigational aid Viking mariners used to locate the sun and traverse the sea before compasses were developed. A crystal found in the wreck of a British ship that sank off the island of Alderney in 1592 could have been used as a sunstone, they say, according to the BBC. Sunstones were once considered “mystical,” since they were said to be able to pinpoint the sun’s position even through the clouds, but a 2011 study found the stones were actually real. The crystal, an oblong shape about the size of a pack of cigarettes, was found near the navigational equipment. And it’s an Icelandic spar, the type of crystal scientists say the Vikings used, because it can diffract light into two distinct rays. Scientists tested a similar crystal and found it was indeed possible to determine the direction of the sun by finding the point where the rays converge, even after the sun has set. As for why no intact sunstone has been found at a Viking burial site, scientists think that could be because the crystals shattered when warriors were cremated. a group of physicists and optometrists say they have cracked the optical properties of the Viking sunstone, which legend has it aided the northerly, often storm-beset navigators long before the invention of the compass. But to do it requires using a squid-like sense of direction. A report released in the Proceedings of the Royal Society A, lays out the possible inner workings of the Vikings’ legendary sólarsteinn, which was said to reveal the true bearing of a hidden sun, even on overcast days and during long summer twilights in the northerly latitudes. Researchers long speculated that the sunstone might have been a transparent type of calcite, common in Iceland, that has optical properties akin to linearly polarizing filters for a camera. Light passing through such a crystal, including the common Iceland spar, changes in brightness and color as the crystal is rotated. Vikings presumably could have used such crystals to observe polarization patterns and thereby pinpoint the direction of the sun. But exactly how this was done was an enigma, until now. Guy Ropars and Albert Le Floch of the University of Rennes’ Laser Physics Laboratory in France, led the latest study, which has solved the mystery of the myth they say by attacking the problem backwards. “Rather than thinking in term of polarizer, we have deliberately chosen to ‘destroy’ the polarization of the light,” Ropars told Discovery News. 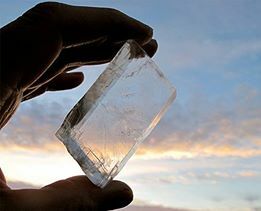 “Iceland spar behaves theoretically and experimentally like a perfect depolarizer.” In other words, with the crystal held up to the sky, there is one specific angle of rotation, called the isotropy point, at which the crystal eliminates all polarization of the light passing through it. Here’s where the “sixth sense” comes in: The investigators say that if you look through the crystal in its depolarizing position and then pull it away suddenly from your line of sight, you can catch a glimpse of a faint, elongate yellowish pattern known as a Haidinger’s Brush. The key here is that the ends of that yellow shape point directly toward the sun. The Haidinger’s Brush phenomenon amounts to a greatly scaled-down version of the specialized ability of many insects, cephalopods, amphibians and other animals to “see” polarization patterns in the sky or water. That’s how those animals navigate. Turns out the Vikings may have too. When Ropars’ group asked test subjects to use their method to identify sun direction, their answers were accurate within 5 degrees. Coupled with a second technique observing the changing polarization patterns passing through the crystal, also tested and described for the first time in this study, the Vikings could have established a reference point that could be used even when the sun was fully hidden, upping the sunstone’s accuracy to within 1 degree. Ropars insists that sunstones could have helped the Vikings in their navigation from Norway to America, as the magnetic compass had yet to be introduced in Europe. Alas, archaeologists are quick to point out that no Iceland spar has yet been found in a Viking village. The legendary Viking sunstone that could accurately navigate the seven seas in bad weather may actually be based on a real artifact, claim scientists. After spending three years examining a cloudy crystal discovered in an Elizabethan wreck, researchers believe it could have been used to locate the sun in cloudy weather. The Alderney sank off the British Channel Islands in 1592. “In particular, at twilight when the sun is no longer observable being below the horizon, and the stars still not observable, this optical device could provide the mariners with an absolute reference in such situation,” wrote researchers in the Proceedings of the Royal Society A, a scientific journal. A chemical analysis confirmed that the stone was calcite crystal, otherwise known as Icelandic Spar — believed to be the mineral of choice for Viking sunstones, reports Fox News. Owing to the crystal’s unusual property of creating a double refraction of sunlight, the sun’s position can be pinpointed with remarkable accuracy simply by rotating it against the human eye until the darkness of the two shadows become equal. Researchers say the principle holds true even when obscured by thick cloud or fog. It may not live up to its reputation as a magical gem that bestows the ability to plot the sun’s course even at night — as described in Icelandic fables — but the antique navigational aid could be behind the Vikings’ reputation as peerless explorers. Experts believe that Nordic adventurers may have beaten Columbus to the Americas by several centuries, according to the Independent. The rectangular crystal has been studied by scientists at the University of Rennes, in Brittany, France, who suggests that Tudor sailors may also have used the stone hundreds of years after the end of the Viking Age.